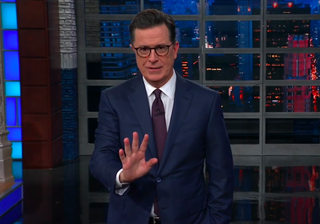 Before the divine comedy intervention, though, Colbert had a devil of a time keeping a straight face as he examined how Tuesday’s surprising announcement by Arizona Senator Jeff Flake that he will not be seeking reelection was laid at Donald Trump’s doorstep like a rotten, racist squirrel carcass. Colbert, while appreciative of a Republican elected official breaking the wall of complicit silence over Trump’s habitual acts of, according to Flake, “despotism,” “anger,” and “resentment,” also asked when a Republican who isn’t on his way out the door will actually do the same. (Flake joins also not-running Republicans John McCain and Bob Corker in, as Colbert says, finding their balls only as they leave us to deal with the horror show they’ve been enabling all this time.) Responding to Flake’s rationale that he will have to answer to his children for what he did or didn’t do, Colbert suggested it might go something like this: “I waited until I was quitting until I pointed out my boss was a lunatic, now eat your radioactive dog meat.” God help us.